It was on bended knee that Midwest Rescue stopped to catch our breath these past few days, for our hearts are bruised and we are hurting. When asked to describe Midwest Rescue, our answer is simple; we are small and we are passionate. We put our hearts in the forefront of what we do and the decisions we make. And that makes us vulnerable. But the many privileges that accompany such vulnerability are gifts wrapped in immeasurable awe. For that we are grateful. Monday brought the tragic news of a second loss to our rescue family in two days, which is unbearable for us. Our sweet PayTon passed away in the arms of his family Monday afternoon, a hero to many, and an angel now amongst us. To us, life at that moment was simply not fair. Our hearts ache, but because of who our PayTon was, our faith remains unwavering. For PayTon’s story is one of great joy, one of growth, inspiration and hope. PayTon was the runt of his litter, one of five boys and one very bossy little girl. Like many rescued dogs, PayTon did not have an easy start at life. He was neglected and unloved by his initial owners. Life, in general, caused this timid boy to hesitate before trudging forward, and it took a long time to realize that he did indeed have a tail as it was most often tucked tightly against his belly. But PayTon was named after a great Chicago athlete, a man of many strengths and inspirations, a man of astounding stature and talents, a man of strong beliefs who conquered many obstacles in life. Like our PayTon, he too fought the battle with cancer. And like our PayTon, he too was taken from his loved ones far too soon. PayTon held true to his namesake. He was strong and held a grace about him that was both profound and simplistic. 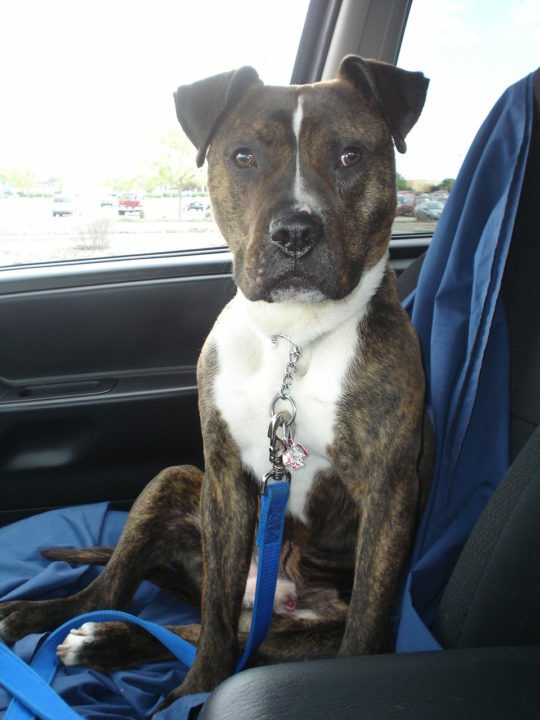 Our PayTon changed the minds of many people who were not advocates of the pit bull breed. He tamed their fears with his puppy like cuteness…he dispelled their hate with his gentleness and changed haters into believers. PayTon started life unsure of himself. But because of the remarkable devotion of his true, forever family, he learned that life is not always scary, and even in those moments of fear, there is a conquered serenity of reward waiting in the horizon (usually guised in the form of a treat)! When PayTon was adopted, he became a part of an amazingly close-knit family. 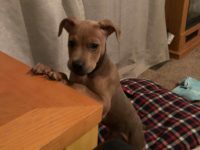 He went from an unwanted dog living in a crate in a basement to the most beloved dog in the world. His parents, our good friends, adored him. Plus, he had a loving grandma and grandpa, aunts who doted on him, a doggie cousin Bubba, and the icing on the cake was that he got to spend summers with his family at a summer home where he ventured with water, swimming and beachcombing. PayTon led the dream life of any dog, and that made us happy! PayTon soon became a foster sibling and what a great model he was for the infamous Leonidas of ours! Often seen cuddling on the couch, PayTon easily bonded with Leo, giving him a family and a brother in all ways. To see PayTon sitting on Leo’s head was just another day in the life! PayTon was charismatic, often attending our events as an advocate for our breed. People were quick to pet PayTon in all his brimming cuteness. And we were quick to sing his praises. We always will tell his story, for his is a bright chapter in our lives. Our mission in rescue strengthens and becomes more defined with each new dog we bring in. Each life adds a definition that is personal and unique, each adds value to our growth in processes and personal beliefs, and each leaves their paw print on our hearts. We will miss you PayTon, but will tuck you safely into that space within our hearts that belongs just to you. Your spirited body wags whenever you saw us, that beautiful and excited recognition every time you laid eyes on us, will never be forgotten. You never ceased to make us feel special when we were together. Knowing that we held such a special place in your heart made ours dance! Don’t be a stranger to our dreams, visit us frequently and align yourself with the others whose journeys have taken them to that place of perfection. You are in good hands now, you are in the presence of capable souls, those familiar to you and others not, but all part of our rescue family. Donnie, Saki, Brian, Capri…greet PayTon and love him for us, okay? Keep him close to you, and to us, always. Our gift to you PayTon is our laughter for that is what you brought so easily to our hearts. Let it honor the many joyous moments of happiness and smiles, giggles and surprise you filled our lives with. For that is where you live now, flowing freely from our beings, into the world, touching the wings of our angels.